This post is sponsored by Lil Fishys. I was compensated for my time and received the product for the purpose of this post. Opinions are my own. See Disclosure for more. 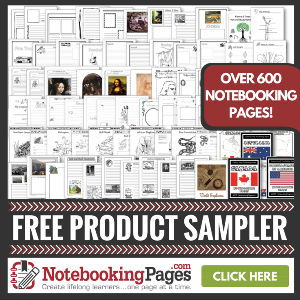 The first notebook works great for older students who are more comfortable with taking notes and writing. The Junior notebook is for younger students (it includes coloring pages) or those who aren’t as comfortable writing. Then we used other printables and worksheets for the youngest students (this year we have a Kindergarten age child) and to supplement what the older students have. Here’s the thing: we live in a land-locked state. (OK, technically we have a Great Lake on our border, but we personally don’t live anywhere near it.) Trips to the seashore are few and far between for us. And we’re not a family that has a desire for an elaborate aquarium or space to keep a lot of pets of any type. Lil Fishys are a great alternative to a “real” aquarium set up. If you are going to study oceans or swimming creatures, I strongly recommend these adorable toys to embellish your study. Lil Fishys would make a great addition to your summer fun. Don’t forget to scroll down for your chance to win some of these fun toys! And, if you want to make a Swimming Creatures unit study (sneaking in some extra school is like a ninja skill for homeschool moms, right? ), here are some more resources we used this year. Facts About Ocean Animals from 3 Boys and a Dog. Jellyfish Animal Study and Lapbook from Homeschool Share. Manatee Animal Study and Lapbook from Homeschool Share. Whales Animal Study and Lapbook from Homeschool Share. Humphrey the Lost Whale study and printables from Homeschool Share. Shark Animal Study and Lapbook from Homeschool Share. Paintstrip Ocean Depth worksheet from Deceptively Educational. Sea Turtle Unit Study and lapbook from Homeschool Share. The Ocean Alphabet Board Book by Jerry Pallotta. in the swim by Douglas Florian. Fish is Fish Fun for a young reader. Here Come the Dolphins! by Alice E. Goudey is out of print but our library has a copy and yours might too. It’s not actually divided into chapters but it is too long to be considered a picture book. A great example of a “living book” to teach about marine life. Coloring Pages from Lil Fishys. Drawing Sharks, Whales, Dolphins and Seals (How-to-Draw Book) . This book is a little more “serious” than the next one. Drawing Sea Animals With Numbers . Ready for some Summer Fun with Lil Fishys? Lil Fishys is giving away a Lil Fishys aquarium and a grab bag of Lil Fishys Toys. They’re choosing three winners! Want to find out more about Lil Fishys? What are your favorite resources for learning about Oceans or swimming creatures?